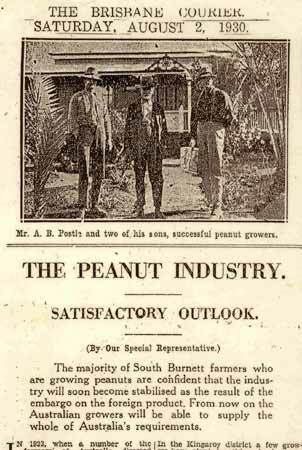 On Saturday August 2, 1930, a “special representative” from the Brisbane Courier newspaper (the forerunner to the Courier-Mail) reported on the state of the peanut industry in the South Burnett. His conclusion was the industry had a “satisfactory outlook”. And he was right! “The majority of South Burnett farmers who are growing peanuts are confident that the industry will soon be stabilised as the result of the embargo on the foreign product. From now on the Australian growers will be able to supply the whole of Australia’s requirements. “In 1923, when a number of the farmers of Australia directed their attention to peanut growing on an extensive scale, they knew that, in common with all new ventures, the industry would require much pioneering before it could be stabilised. The farmer’s greatest drawback from the outset was that he had to compete against the imported article, principally from China, and before an embargo could be reasonably applied it had to be proved of course that the growers of Australia could produce sufficient peanuts to supply the home markets. “The South Burnett, within a radius of 35 miles of Kingaroy, supplies from 80 to 85 per cent of all peanuts grown in Australia today and Kingaroy with its wonderfully fertile volcanic soil, combined with ideal weather conditions, is recognised as the home of Australian peanuts. Other areas growing peanuts in Queensland are Millman and The Caves districts of Rockhampton, also Degilbo and Biggenden, while the farmers of the Atherton Tableland are producing increasing quantities each year. “In 1924, the Queensland Peanut Board was created, having its headquarters at Kingaroy. The industry expanded so rapidly that in 1927, bulk storage equipped with the most modern machinery known for the treating of peanuts for marketing, was erected at Kingaroy at a cost of 50,000 pounds. These storage facilities were constructed to the order of the Queensland Peanut Growers’ Co-Operative Association Ltd, the directors of which also are on the directorate of the Queensland Peanut Board. The scheme was made practicable by growers agreeing to the deduction of 1/4 pence per pound on all peanuts delivered to the Board for a period commencing with the 1926-27 crop until the liability is paid in full. “At the end of June 1929 the Board had a surplus from the 1928 crop of 1000 tons which but for the similar tonnage imported that year would have been cleared. At this time a crop of 5500 acres was ready to be harvested. This realised 3500 tons, making an accumulated total of 4500 tons which was most disturbing in view of the fact that Australia only consumes approximately 4000 tons annually. These conditions, naturally, had the effect of creating a temporary panic among those engaged in the industry. Growers were called together by the board and it was decided a voluntary system of restriction would operate in 1929. “Whereas in 1928, 523 growers planted 5500 acres, 250 growers planted 2300 acres for the 1929-30 season. The idea was to restrict production until an embargo had been created on the foreign article and also to allow the clearance of a large quantity in storage. “At present there is about 3000 tons stored in the Kingaroy silo. It must not be construed from this that the bottom has fallen out of the industry. On the contrary, a large majority of the growers interviewed by the Courier representative have every confidence that he industry will soon become stabilised. “The quality of the Queensland peanuts have been found to be equal to anything grown in the world. So far Kingaroy growers have not been troubled with disease but on odd occasions mice have seriously attacked the crops … the board employs at its silo 47 girl pickers, whose duty it is to sort the nuts into their different grades, and nine men in addition to an office staff. Mr W. Muir, who is also a grower, is the manager of the board and Mr J. Nesbitt is the accountant. The following are the members of the board: Messrs C.F. Adermann, C.F. Petersen, A.S. Clark, A.C. Perske and A.E. Gibson (government representative). “Among the largest and most successful growers of peanuts in the South Burnett are Messrs A.B. Postle and Sons (near relatives of the famous Australian runner A.B. Postle), of Memerambi … Messrs Postle and Sons consider that the industry has a great future and their plots so far have paid them admirably. “Mr L. Townson, of Wooroolin, has grown up to 50 acres of peanuts but this year planted 17 acres only. Mr Townson is satisfied that the industry when stabilised will be most profitable. “In the opinion of Mr F.C. Petersen (Kingaroy), who is a director of the Queensland Peanut Board, the industry is here to stay. “Mr H. Young (Wooroolin) is one of the pioneer growers of peanuts. For the last three years he has planted an average of 50 acres and from his experience over that period each acre has given him a return of between 8 pounds and 9 pounds. “Mr A.W. Howlett (Nanango Road) has grown between 25 and 50 acres of peanuts over the last three years. He stated that threepence per pound yielded him a payable return … Mr Howlett is most enthusiastic regarding the possibilities of the industry. He has built his own threshing plant which has given splendid results. “Messrs H.P. Hansen and Sons have grown as much as 62 acres of peanuts with considerable success and this season’s threshing has given them a return of 31 bags of Virginia Cluster peanuts to the acre. Mr H.P. Hansen was one of the first growers in the South Burnett to construct his own threshing plant.